Like many of you, I live in a city apartment. So my craft supplies are stuffed in a corner of our hall closet. Recently, I couldn’t find my sewing scissors – which are like the North Star of my crafting galaxy. So I vowed to tidy up. 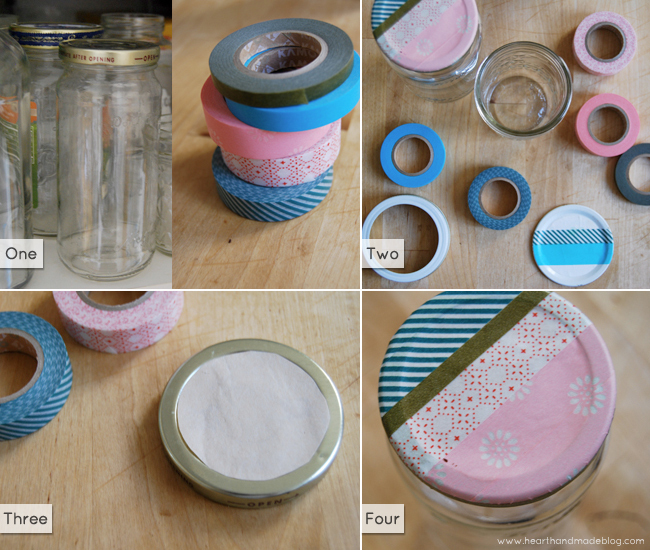 Of course, one of the best parts about reorganizing is the range of pretty canisters and storage supplies. But I decided to kill two birds with one stone and also weed out our cupboard above the fridge. We save our empty spaghetti sauce and mayonnaise jars, but it was beginning to look a glass graveyard up there. So I plucked a few of the most useful ones and repurposed them to hold my supplies. That way, I can see at a glance what’s what in the closet. I should also mention that I recently hopped on the Japanese paper tape bandwagon, and this was a perfect first project for my cheery new tape collection. 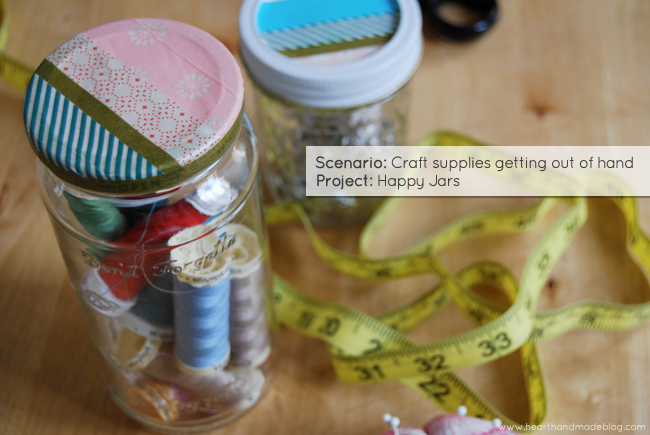 And yes, I am encouraging you to buy yet another craft supply in order to organize the rest of your supplies – this irony is not lost on me! But the tape is indeed happy tape, as billed! If your lids have printing on them, cut out a circle of an old grocery bag and tape it on top of the lid. Then place strips of the Japanese paper tape across the face of the lid, alternating colors and patterns. If you have a one-piece lid, extend the strips slightly over the edge. When you’ve completed the top of the lid, then wrap one piece of tape around the “side” of the lid as shown, to cover all the ends and finish. Such a cute and smart idea! So fun and such a great idea! Happy tape indeed! Thanks for sharing, a wonderful idea! What a cute storage idea! I am definitely going to have to spruce up a couple of jars this weekend. So simple and such a great upgrade! These are SO pretty! I'm always cleaning and saving the jars, then recycling them because there is no cohesion. This is a great idea! I'll be linking.